One may recall from previous post, “The Lord Taketh Away…Maggie!” (3/5/17) that I tearfully purchased a burial pod for my furry friend in February this year. But six months after the significant diagnoses of megacolon, liver mass, pancreatitis, cholangiohepatitis, and anemia, Maggie is still here and on the go! Graduation can wait…room service please!! Why is this important? The Lord often reveals His truths and glory through His creation, whether through the lion’s boldness, the ant’s diligence, or the beauty of the lily of the valley. In fact, the Lord can reveal His truths through any and all the circumstances in our life…which includes the life of Maggie! God is not bound by any report of man whether it is a negative, even terminal, medical report, a ‘pink slip’, divorce paper or ominous threat. When such a report comes, it may be time for the ‘burial pod’ but faith should open our heart to whatever the Lord reveals for His purpose and pleasure. When the Lord calls us to “go” or to “do”, He will enable us, provide for us, and fulfill His purposes through us in spite of limitations and obstacles. It is through those challenges that faith muscles grow and God’s word is proven. May this truth take root – God is not deterred when the sun is setting on our life. Age, dwindling resources, and increasing weakness are not hardships to God who declares, “My power is made perfect in weakness.” The Lord is not looking for super Christians, only surrendered vessels in whom He can dwell. Whether He allows or brings us into storms of hardship, disappointment, sickness, or betrayal we can hold onto the promise of Romans 8:28 which represents the sovereignty of God. For those who are His, all circumstances, events, calamities and details – even enemies – are under His control. Our ‘own understanding’ leads us to ‘figure it out’, ‘plan ahead’ and ‘move forward’ without hearing from God. While the world rewards ‘self-starters’, the ‘empowered’ and ‘ambitious’, the Lord is seeking surrendered followers who wait and trust Him with the lead. God knows when every “sparrow falls to the ground” and He knows the exact day Maggie will ‘fall to the ground’. Until then and until that day comes for us, we are not bound by any bad report of man. If “our lives are hidden in Christ” He has reign over our lives and will “order our steps” as we surrender to Him. “Lord, I pray that we can live each day with faith that You’re in charge, that You have all authority, and that You are well able to order our steps. I pray for a hunger to know your word more and meditate upon it so it takes root and lives within me. Help me to commit and obey. May the reports of ‘man’ – no matter how ominous or weighty – never cause us to shutter but compel us to seek you, trust you and wait upon you for direction. Amen.” . When the Lord “Taketh Away”…Maggie! Soon after Maggie’s fabulous New Year Resolutions (see December 2016: Resolutions? Maggie Knows the Best!) she went to her vet with constipation and another seemingly minor complaint. Surely simple interventions would resolve the problems and we’d be on our way…. “Haven’t you noticed that Maggie’s lost weight over the past few months? She’s lost 2 pounds!” The concern on Dr. Chiverton’s face seemed odd, I thought slimming down was a good thing. However, x-rays, a sonogram and overview of blood work analysis yielded bad news…liver tumor, pancreatitis, and the final stage of chronic constipation – megacolon. I saw the results and know what they mean for a 16 year old cat, “I want to treat her, make her comfortable, but I don’t want to prop up her life artificially to make me happy.” With that I left Maggie in the clinic hospital. I do believe in the sovereignty of God and His desire to reveal Himself to us and that He often does so when we are oppressed and in turmoil. He honors our decision to go forth as He leads even when our feet are iron clad. With a deep exhale, a great weight was lifted from me and the following days passed lightly, even enjoyably. Maggie did survive but soon returned to the hospital. This time I began perusing ‘final destination’ plans for my furry good friend. “I believe God’s going to heal Maggie”, said husband Bob. I almost chuckled when he added, “she can be with us another 5 years.” I was hoping for another 5 weeks, when the ground wouldn’t be so frozen…. I never doubted that Maggie was a good and perfect gift from my heavenly Father. After finding her and her litter at an abandoned brownstone, she was the friend who sat beside me during times of grief, cuddled alongside when others betrayed,and remained constant when life events brought upheaval and confusion. Maggie is a ‘good and perfect gift’. From that my heart grasped the further truth: when God gives a good and perfect gift, His hand is seen in the beginning and in the end. I sincerely and decidedly handed Maggie back to the Lord,” I give her back to you Lord” and my worries lifted. And what is Maggie’s status? We’ll be storing this away for now! Subsequent exams show her colon shrunk. Recent blood screens find liver enzymes normal. Is the tumor gone? I don’t know. Maggie’s eating again, gained 3 ounces in two weeks and, pardon me but she’s even pooping! It hardly gets better. Animals may be nicer but are not more important than people however, spiritual lessons and intimate fellowship with the Lord has immeasurable value. When scripture transforms from written word to living word, we hear from heaven. We will not ‘throw away’ the burial pod but will trust the Lord to keep that which we committed to Him. We trust Him to prepare us for every life event – the giving and the taking away – and anticipate His lovingkindness even or especially when brokenhearted. 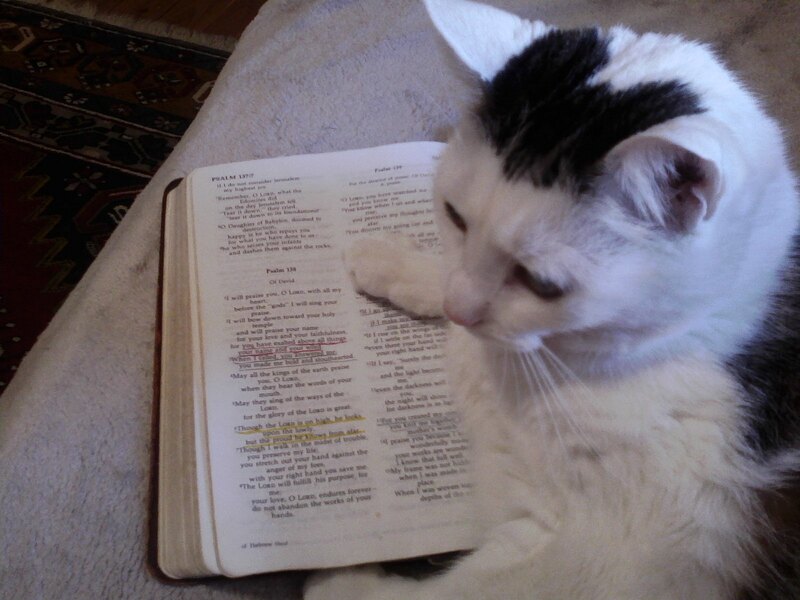 “A righteous man cares for the needs of his animal” (Proverbs 12:10) Maggie agrees…. and slaps a low five! Resolutions? Maggie Knows The Best! In fact, there is no need to wait for a calendar change or ‘ball drop’ to start these…. I pray that we find the Lord in greater measure. And that God’s word encourage us as we wait upon Him through trial and storm, finding rest through the Holy Spirit. May the Lord order our steps into the New Year. God bless you! After my beloved cat Remy died, I pondered this question at length. A few days later, while approaching a co-worker’s office, I caught the end of her conversation with another. They were apparently discussing heaven. What? No soul? I did not offer the objection that arose in my heart. Obviously this sincere woman did not know Remy….nor the likes of Cookie, Scout, or Tina. What about beautiful Kelly, our seeing eye dog, whose heart was solely bent on pleasing her family? And Alison, her ‘co-worker’ who, in times of grief, could read my countenance and run to comfort me? Alison….who, in her senior years of retirement, saved her family during a house fire…. no soul??? I began a Biblical search to grasp a broader understanding and, quite frankly, validate my hopes and own anticipation. Animals are frequently present in the Bible, most often in a positive and purposeful way. God is not indifferent to them at all, in fact He displayed His unmatched creative glory when He fashioned the animal kingdom. The Lord’s overtures to animals are actually vast, from Genesis – where He ushered in every specie into an ark – to the ‘lion and the lamb’, noted in scripture as present in His coming heavenly kingdom. In the book of Numbers, chapter 22, God ‘opened the mouth’ of a donkey, letting him speak his mind to his rider Balaam. It is obvious from this text that the donkey had more wisdom than his master. We are but stewards of this earth and all that is upon it – God is the rightful owner of all, “….every animal of the forest is mine, and the cattle on a thousand hills. I know every bird in the mountains, and the creatures of the field are mine.” (Psalm 50: 10-11) . The Omnipotent and Omnipresent One knows every bird…while, according to National Geographic, man has yet to even identify 86% of earth’s species! There is more in scripture to affirm that the Lord knows and cares for all his creation. No Bible scholar would dispute these findings. The question remains, do animals go to heaven? If the soul is where the mind and emotion meet, where intellect and reason dwell, then yes, of course, animals have souls. Who doubts their capacity to discern friend and foe, express emotions of love, anger and fear? There is little doubt that animals communicate. They grieve for lost members – do they not love? Anyone with a beloved pet knows, they receive and give. Delving deeper, do animals have a spirit? Can they hear from God? There are Biblical examples of animals hearing the call of God and obeying – at His call they came to the ark, at His call fish swam into nets. They are created for the service and pleasure of man but owned and governed by their Master. They live out the life designed by their Maker. Jesus Christ provided forgiveness of sin to all who receive Him. As “…all have sinned and fallen short of the glory of God”, Romans 3:23, we need a Savior. The shed blood of Christ is the atoning sacrifice for all who come to Him in faith. Through Jesus Christ we have salvation and life eternal, “…God has given us eternal life, and this life is in his Son.” I John 5:11. Assuredly, the Son of God did not die for the eternal life of animals. However, animals did not rebel against God. Within Biblical teaching we can see that it is man who is born with a sinful nature, man who rebelled against God, man who is capable of every wretched sin conceived in the bowels of hell. Assuredly, it is man who is in need of a Savior! Above all, we must ask, are we reconciled with God, are we heaven bound? We have a Savior, our Good Shepherd, who has prepared our way to eternity. Much of what awaits for us there is a mystery. Animals will surely dwell in the coming Kingdom of God – will Remy be there? What about Cookie, Kelly, Scout? Why not?